We have all eaten meringue, right? But have you ever had a cake made of meringue? Called a Pavlova, after a famous ballet dancer, it is a light and delicate cake, baked until crispy on the outside while still lovely and spongey inside. Topped with whipped cream and fresh fruit, it is an outrageously beautiful and beckons to be tasted. But this is where I have to admit that I am afraid of meringue. I do love it, but I truly have yet to perfect it. Early in my meringue-making days, I would just beat the heck out of the egg whites, turning them into a styrofoam-like substance, totally dry and weightless, devoid of that thick, smooth, marshmallow-y mouth feel we all love so much. Such a disappointment. Since then, I have made meringue cookies, meringue-topped pies, and a couple of Pavlovas, each time becoming a little less intimidated by the prospect of the overbeaten egg white and the resulting chorus of “It’s not that bad, really.” Admittedly, that chorus played only in my head, never said by any recipient of the styrofoam, er, meringue topping. This recipe, though, is an excellent way to learn just how much beating meringue can take before “styrofoaming”. It also illustrates the usage of vinegar in the mix to stabilize the meringue to avoid it collapsing. It is thus a good recipe to make when you are feeling patient, since it will likely take a good 10 minutes of beating to reach the desired “stiff peak” consistency the Pavlova requires. All that aside, Pavlova is one of the most beautiful of desserts. It is also one of the most pleasing from a textural standpoint: Crispy on the outside, marshmallow-y, light, and almost but not quite chewy on the inside. Topped with dense, creamy, fluffy whipped topping and fresh fruit, it is a wonder. Most impressive. Not to even mention how it tastes. So chocolate-y, studded with chips of dark chocolate, not too sweet. The slightly sweet and tangy whipped mascarpone cream topping provides the perfect complement to the chocolate. All topped with juicy fresh fruit. Perfection! And, I do admit, I didn’t whip the whites to completely stiff peaks, my impatience and my fear of styrofoam won. Probably needed an additional minute or two. It spread a bit more than I would have liked and was not as thick as I wanted. Still massively delicious and lovely, though. So give this a try. Your patience will be rewarded. It obviously doesn’t need to be perfect to taste perfect. Enjoy! On a sheet of parchment paper, trace the outline of a 9″ pie tin or cake pan with a pencil. Turn the paper over, so the pencil side is face down, on a 12×17 baking sheet. Using a stand mixer fitted with the whipping attachment, whip egg whites until foamy soft peaks have formed. While continuing to whip, slowly add the sugar and the salt. When whites are thick and shiny, test occasionally to see if the peaks that are formed by removing the attachment are stiff and pointy. They should not fold over upon themselves, but should remain standing and pointed. This stage should take around 10 minutes to reach when them mixer is set at a medium-high speed. Once the stiff peak stage is reached, sift cocoa over the meringue, add the vinegar and chopped chocolate. Gently fold in until few streaks can be seen. Pour meringue onto parchment. Using rubber spatula, form into dome shape an inch or two smaller than the penciled circle. The cake will spread slightly when baking. This spreads out, so be sure it is whipped to “stiff peaks”! Place into oven. Immediately lower temperature to 300F. Bake 60-70 minutes. Cake should be crispy on the outside and give slightly in the middle when touched. Turn off heat and leave cake in oven until both reach room temperature. Whip the first 4 topping ingredients together. 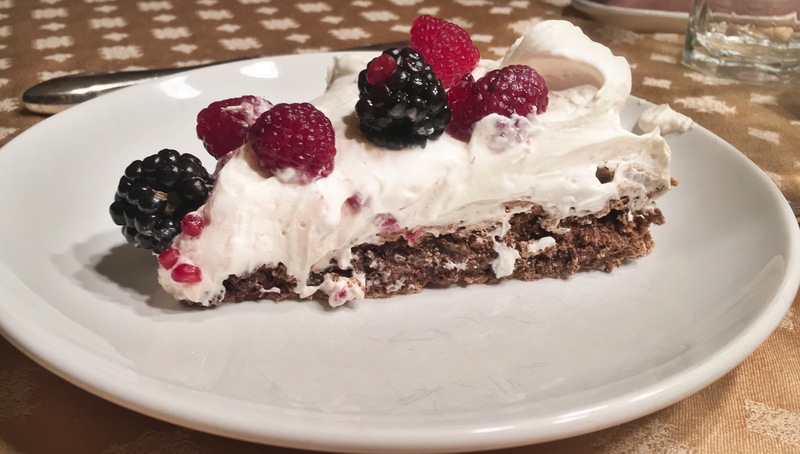 When ready to serve, top cake with whipped topping, then add fresh berries. Serve. Enjoy!